The hospitality industry uses a wide variety of casters and wheels from stainless steel swivel casters to soft rubber wheels on rigid and stem mounted casters. In this category we will focus ion the bell hop carts, the pneumatic wheel caster. 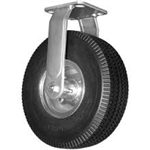 Hotels use the pneumatic air filled wheels on their carts for several reasons, easy to roll with large loads, luggage carts need to roll quietly, these carts and dollies roll over transitions in elevators and indoors to outdoors very often and they need a caster to handle these rigors. The Pneumatic or semi-pneumatic casters are perfect and have been used for many years. We offer a high quality replacement option in the brass plated or traditional zinc coated steel. 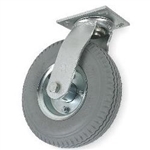 These casters and wheels bolt on to your existing carts and are offered in swivel, rigid and in several sizes and top plate options. Our line of pneumatic casters is fairly extensive. Bulk quantity discounts are available. For large volume, recurring or blanket orders, please call us at 1855-WHEEL11 (855-943-3511). Air Filled Pneumatic Caster 10"x 3" Wheel, Swivel Brake Options Available. Air Filled Gray Pneumatic Caster 10"x 3" Wheel, Rigid. Air Filled Pneumatic Caster 6"x 2" Wheel, Rigid. Air Filled Pneumatic Caster 6"x 2" Wheel, Swivel Brake Options Available. Air Filled Pneumatic Caster 8"x 3" Wheel, Swivel Brake Options Available. Hospitality Caster, Brass Plated, Pneumatic 8"x 3" Wheel, Swivel Bellman and Luggage carts. Brake Options Available. Semi Pneumatic Caster 8"x 2-3/4" Wheel, Swivel Brake Options Available.